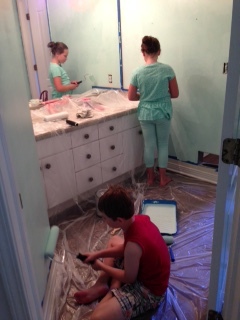 Last week I let my 7- and 9-year-old paint their bathroom. Exactly. What was I thinking? “How about you read in the hammock?” No. “What about taking a bike ride?” No. “You could build a Lego city!” No. “Want to paint nails?” No. And then my dear sweet husband pipes up with, “How about you and Mom go to Home Depot and pick out a paint color and you can paint your bathroom?” YEAH!!!!!!!!! So off I went with my daughter to pick out paint. In full disclosure, I did claim veto power on the Fuchsia and Bright Turquoise that were her first two choices, but in the end she settled on a cheery shade of blue, the color of the sky on a sunny summer day, and off we went with our paint and supplies to paint real walls in our real house….walls that real people will see…..walls in a room that gets used by real guests when they come to visit. Real walls. In our home. With permanent paint. My palms are sweating as I type this. We didn’t get to the actual painting that day. In our spontaneity, we forgot that first there would be real trim to caulk, real holes to spackle, and real edges to tape. No surprise, the kids had zero interest in helping with the real prep part. I think I half-hoped (ok maybe I fully-hoped) that by the next morning they would have lost interest in the real painting part too. But no such luck. So there I stood with my two eager children, grubby clothes on and paint rollers in hand, saying silently to myself, “It’s just paint. You can always fix it after they’re in bed.” And with a deep breath, I showed them how to load the paint onto the roller, and roll a light layer of color onto the walls. For the first few minutes I was a bit overbearing with my explicit directions and quick hands ready to reach in and take over. As often happens, I could see the two of them becoming exasperated by my hovering. No shock here, but it’s not just with home improvement projects that I become controlling and anxious. I think I often exasperate my children with my penchant for hovering. It’s something I’m painfully aware of in myself, and it genuinely takes a very conscious and intentional effort on my part to close my mouth, remove my hands, and allow these two young people to find their way and work it out for themselves. And so, maybe it was because I knew I was doing something totally out of my comfort zone, or maybe it was because I was suddenly determined to really try to be that laid back mom, or maybe it was because it’s the middle of summer and I’m bored too, but I just stopped. I shut my mouth. I stepped away. I even left the bathroom to go get the camera. I gave myself a good workout in letting go of control, and (I hope!) I gave my kids an opportunity to show that they are capable, creative, independent…growing up. After about 45 minutes, they decided that they needed a real snack break…and a real play break and….well, pretty much they decided they were done really painting. But that one wall they smattered with color was really theirs. They did that. They felt proud. I could have spoiled that wall with my own real smattering of critiques and corrections and quick hands diving in to fix. But by the real grace of God, I kept my mouth shut and my hands away. They actually did a pretty darn good job. And even if it had been awful…it’s really only paint, right? How will they ever know what they’re capable of creating if they aren’t given the real chance to dip their own brush into the bucket? One of the things that never ceases to amaze me about God, is how willing God is to let his children take hold of the paint brush; how, from the very beginning when God created human beings, God has entrusted us to not only care for creation, but to be intimately connected to the very act of creating! Even when we have no experience, our hands are shaky and our strokes are messy, our Heavenly Parent tells us we are capable and gives us the real space to imagine, risk, try, learn, fail, wonder…and create. It certainly puts my “hover mother” tendencies in perspective. I know that my children need love and security as they grow and learn and discover who they are, but sometimes my controlling actions reveal a painful shortcoming. It happens every time I unnecessarily reach my hand in, open my mouth, or run to the rescue so they don’t fail or make a mess. I cut short another equally important need: the need to feel significant. The need to feel that their lives, their actions, their imaginations, their thoughts, their ideas, their unique brush strokes, are needed. Meaningful. Important. Real. New lessons in parenting and stewardship, all from a boredom busting couple of days, and a simple gallon of paint. Go figure. It’s amazing what a fresh coat of paint, and a brush with God’s grace, will do. Kelly Pittman shares life and ministry with her husband, two young children and a wonderful church family, in Southeastern Michigan. Tags: control, painting, participation, significance, trust. Bookmark the permalink.